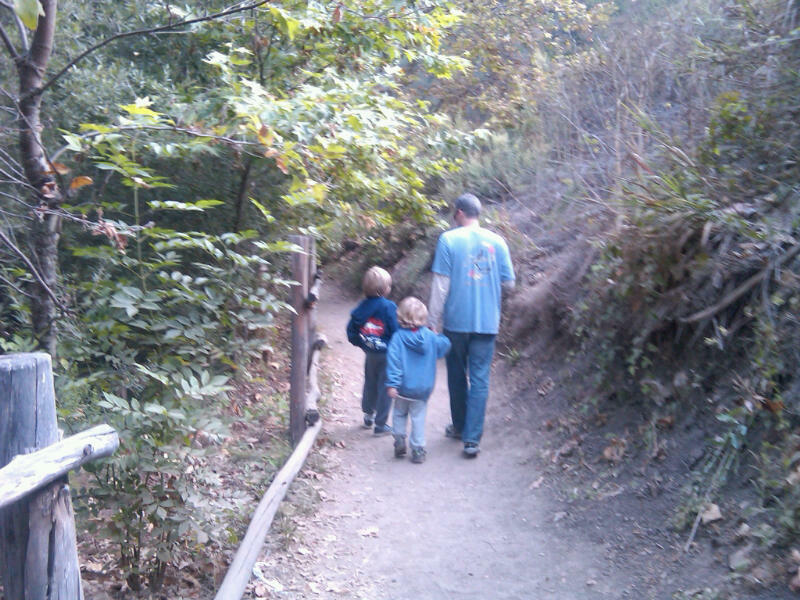 Looking for a rustic family getaway from the South Bay that’s not too rustic? 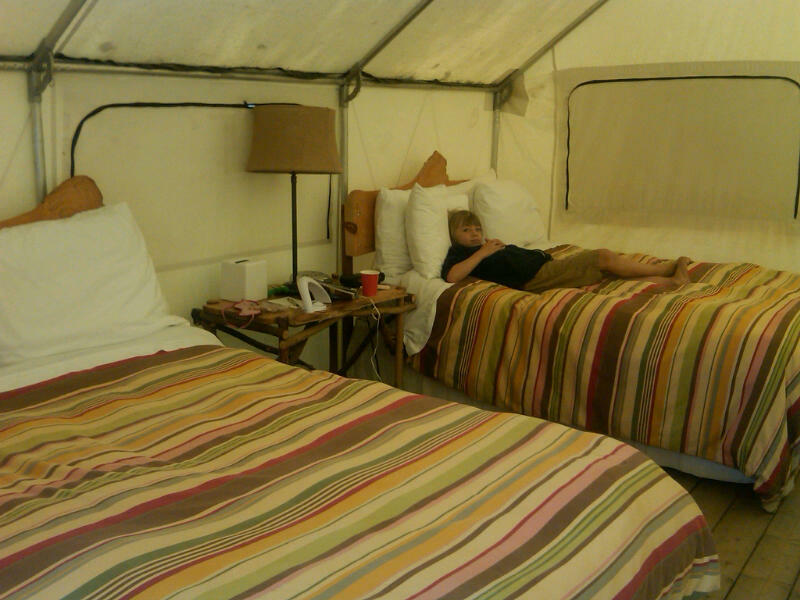 Look no further than El Capitan Canyon, just north of Santa Barbara, to try your hand at “glamping” (glamour camping). 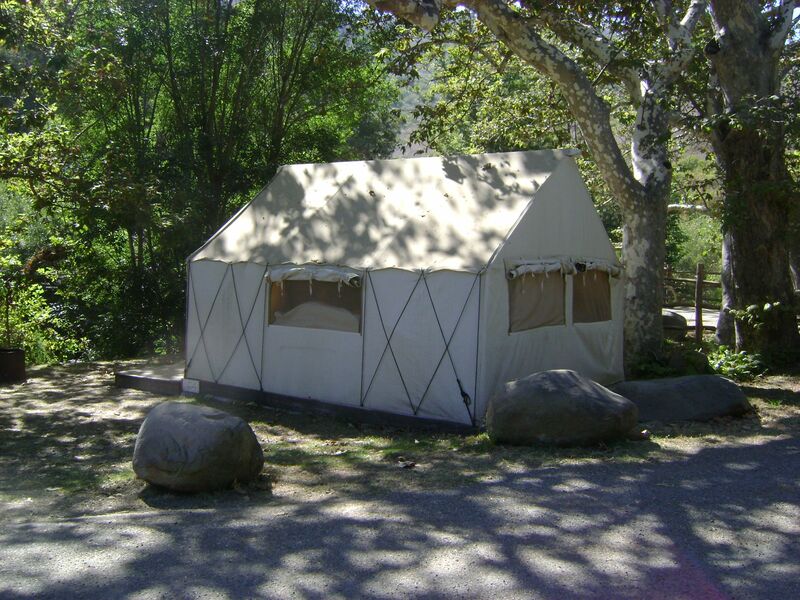 At El Cap Canyon, you can rent well-appointed tents that come complete with beds, linens, bath towels and toiletries, electrical outlets, housekeeping service, and free wi-fi. Outside each tent, you have your own picnic bench and fire pit – plus there’s a playground, heated pool, and well-stocked general store for anything you might have forgotten. Oh, and the bathroom facilities are super-clean and well-maintained, so you’ll actually feel refreshed at the end of a long day of hiking when you take that nice warm shower. On our first day at the canyon, we took a guided hike up to a llama farm to feed some llamas and goats; on the second day we hiked about 20 minutes down the hill to the beach. Our nature sightings included hawks, partridges, gophers, frogs, and mice. Food-wise, we came well-prepared with camp-style treats for our breakfasts and lunches. For dinners, we took part in the canyon barbecue on one night and we bought provisions from the general store and grilled out at our tents on the second night. The campsite is especially welcoming for families with young children; kids are just about everywhere riding bikes and scooters. If you’re a couple looking for a more private getaway, request a secluded spot higher on the hill. However, kids or no, we were grateful for the strictly enforced “quiet time” beginning at 10 pm. After a long day, we were glad for the chance to relax and listen to the sounds of the canyon under the stars. At El Capitan Canyon, tent rates range from $135-$185 per night; cabins begin at $185 per night and go up to $795 per night for the most deluxe two-bedroom cabin. A two-night minimum stay is required on weekends; some holiday weekends have three-night minimums. For reservations, call 866-352-2729.